Hello! 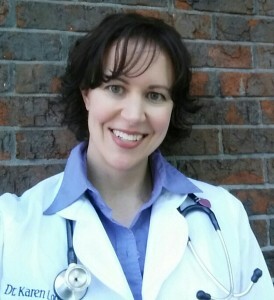 I chose being a veterinarian as a sort of “second career” and have never looked back! I was earning a PhD in molecular cell biology at Washington University School of Medicine, when I adopted two rescued dogs. After becoming more involved with dog rescue, I realized veterinary medicine would be the best career for me. After being accepted into multiple veterinary schools, I chose University of Illinois College of Veterinary Medicine and graduated in 2004. I base my practice on a simple concept: treat people the way I would want to be treated. I take the time to explain diagnostic and treatment options, no matter how complex. My clients appreciate my directness and honesty the most, even when it’s “brutal honesty” sometimes. And, I have learned that laughing a little goes a long way in this job! My clients know I am a doctor, but I am a real person. (Some of my dogs eat poop, no matter what I try.) I currently am “mom” to four rescue dogs, two of which are blind. Additionally, I rescue dogs with significant medical issues from rural animal controls, as well as rescue dogs from puppy mills. In 2013 I founded my house call exclusive general veterinary practice, Metro East Home Vet Care, and in 2017, hired another vet to help me! I can perform acupuncture during a house call, but due to demand, decided to open a small clinic just for acupuncture a couple days a week. If pet owners bring their pets to me for acupuncture, I can help more pets and charge less! I maintain a blog in order to create an accurate but entertaining online resource for pet owners. It’s called VetChick.com, and it contains articles covering a wide variety of pet health topics. I look forward to getting to know new people and their pets! If you have a vet you love, but would like to add acupuncture to your pet’s treatment plan, I will provide that treatment, and leave your other care to you and your veterinarian. Visits to my acupuncture clinic are intended for acupuncture-related treatments only. Nothing makes me happier than helping a cat or dog who has been sick or hurting, and making life better for the whole family.